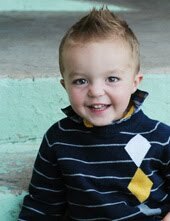 My Child is almost 3. 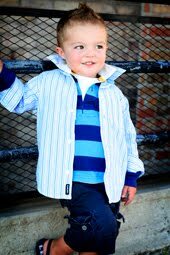 When I got over the Shock and Horror of that reality...I started planning his B-day Party that's coming up in March. I know I know...that is 2 MONTHS away...but the first step is admitting you're nuts...and I already did that:) I also love to do things FAR FAR FAR ahead of time. Instead of rushing to finish something in 2 weeks...I stretch the fun out and do little bits at a time when I want a project to work on. I am CRRRAAAZYY for Birthday parties. Those who attended his 1st and/or 2nd know this quite well. Give me a THEME...and an opportunity to think of cheesy kid stuff and I run with it! With a Birthday Party coming up I've had countless ideas running through my head! I swear...I could go all day with the cheesiest and funnest ideas that kids would love! Only problem is that darn budget that keeps nagging at me. His 3rd B-day is a Pirate Party! His 1st was Baseball themed...and a blast! His 2nd was a Construction party...and even more fun than the 1st! Little to NO mess or cleanup...Cheap...and easy to prepare ahead of time. Any ideas you have of Shapes, Patterns, Numbers, Counting, Alphabet, etc. You will be laminating too! 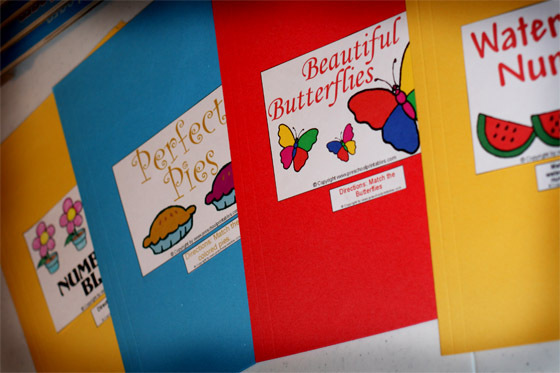 The "Beautiful Butterflies" Game below teaches Patterning and Matching. I printed 2 of each patterned butterfly and taped one of each to the inside of a folder. 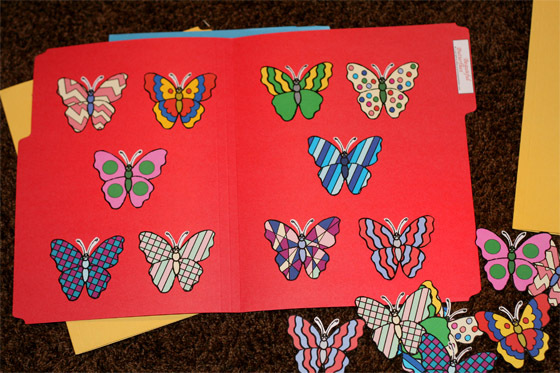 You then laminate the folder and glue an envelope on the back of the folder with 1 extra of each butterfly. Apply a small piece of velcro to each butterfly...and let them match them correctly! 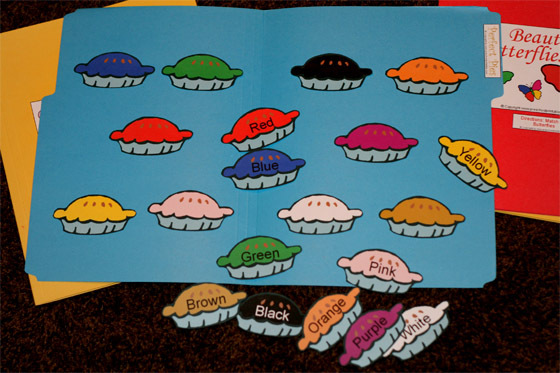 "Perfect Pies" Game teaches Colors! 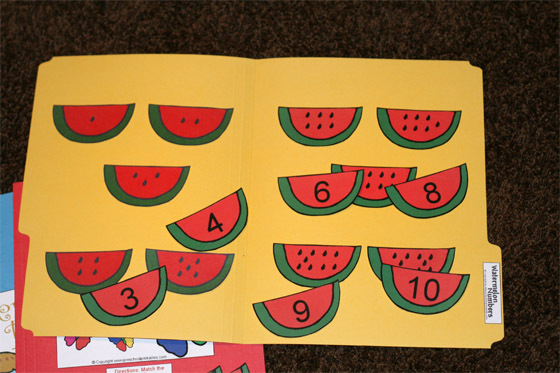 "Watermelon Numbers" teaches counting and Number Recognition! They must count the watermelon seeds and velcro the correct numbered watermelon on the corresponding one inside! Now for my favorite Easy and Quick Recipe. ...my favorite dessert to make on Sunday evenings while we watch a movie! You will love me forever after giving this a try! It is super easy...and always a hit no matter where I take it. I have countless people always asking...How do you make this? Oh my gosh...it is SO good?!? How do you get the swirls inside the cake? It is sooo moist? 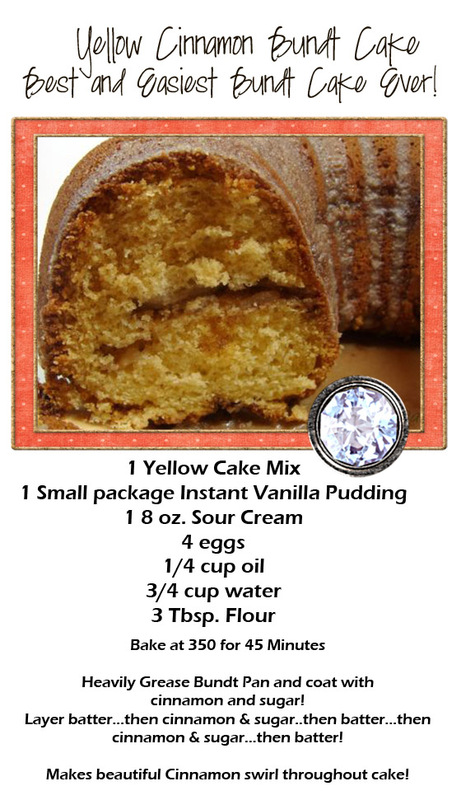 Now you can impress every party with not much more than an 88 cent cake mix! 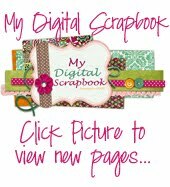 I would normally post my pages on My Scrapbook Blog but I had to share this idea and tip for all you digiscrapbookers! 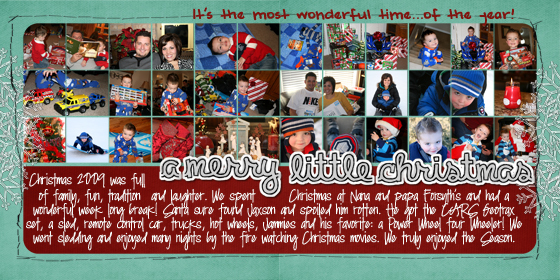 I found this wonderful template on Sweet Shoppe...and it is the perfect way to get ALL THOSE CHRISTMAS PICTURES on a single page. I didn't want several layouts of just Christmas morning in my printed book...(and if you're anything like me...you'll have HUNDREDS of pictures)! This Template let me put over 30 pictures on one page in a cute design. 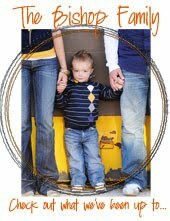 Although I only have 1 child right now...this is the perfect design for families with several children! I hope you'll find some fun and new things to try...and you'll let me know which ones you've loved! Oh man I am excited to read this blog! I always LOVE reading about your fun cute ideas for everything and now they will all be in one place! 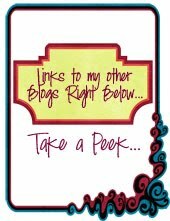 Now I have 2 fun blogs to read! Hey Kristin! 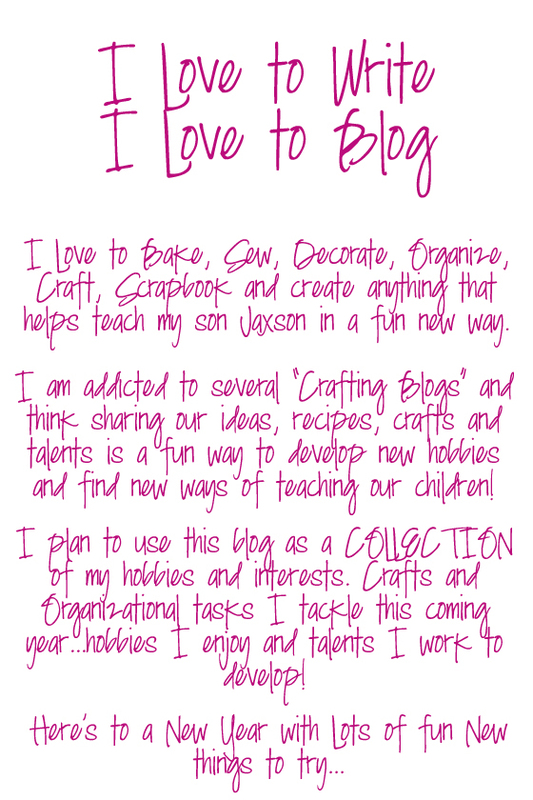 This is Jamie (Loosli) Hendricks, I am so excited for your blog! I love blogs like this. Your family blog is so fun to read. I know this will be great! Good luck! 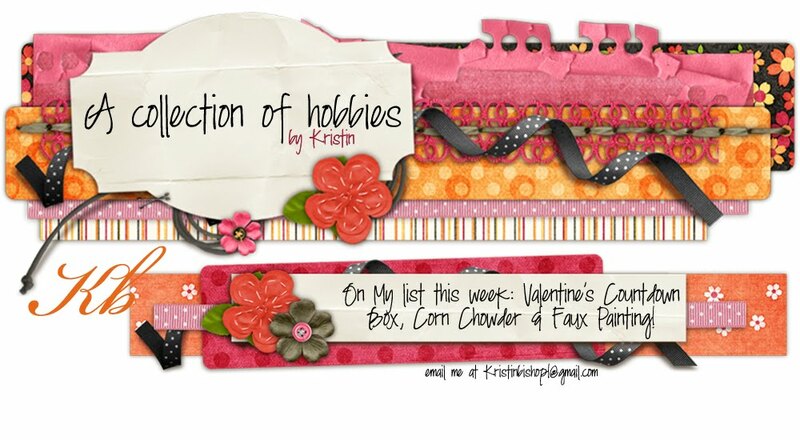 I added you to my list of blogs, hope it sends a little bit of traffic your way!